Pollution in the ocean is not just about the dumping of harmful chemical, physical or biological substances into the sea, but also about the increased ambient noise. Ocean ambient noise results from both natural and anthropogenic (human-induced) acoustic sources. The latter are closely related to maritime shipping and seismic exploration by the oil/gas industry. Studies show that the Underwater Radiated Noise (URN) due to shipping activity has resulted in an increase of at least 20 dB of ambient noise compared to pre-industrial levels (ref. 1). The expected increase of vessel traffic and oil exploration in the Arctic Ocean may result in a further increase of ambient noise. It is likely that regulations on noise emissions are on the way. Faced with these changes, what can we contribute to prevent the growing noise from maritime shipping? Noise is defined as “unwanted” sound. Sound is the rapidly varying pressure wave travelling through a medium such as air or water. A pressure wave can be decomposed into the sum of a series of sine functions with different amplitude and frequency contents using Fourier Transformation. Plotting the amplitude contents in the y-axis versus the frequency contents in the x-axis will give us a spectrum diagram representing the characteristics of a particular sound or noise signal. Water is an excellent medium for sound propagation for two reasons: the sound propagates four times faster in water than in air (1484 m/s vs. 343 m/s). The low absorption rate of water makes sound, especially low frequency sound, travel hundreds of kilometres in open sea. This is why the low frequency range of URN from a ship travelling a long distance away can still be heard. A sound becomes audible when the receiver is able to perceive it over background noise. The audible range of hearing for marine fauna spans from as low as 5 Hz up to about 200 kHz. Marine mammals and fish use hearing as their primary sense and are highly dependent upon sound for navigation, communication, finding food, reproduction and hazard detection. They are likely to be sensitive to the increase in environmental noise. Acoustic masking occurs when the presence of one sound (noise) reduces the ability of an animal to perceive a second sound (of interest). Acoustic masking is considered to be a threat to marine fauna, especially those species that communicate on low frequencies, such as baleen whales. Therefore, an excessive high level of ambient noise in the low frequency range can have a negative impact on their population. A propeller-driven ship has a number of noise sources: the main and auxiliary engines, electric motors and the flow noise due to turbulence in the boundary layer and the wake of the hull and appendages. The propeller is a dominant source, generating the highest noise level at frequencies below 200 Hz (ref. 3). If cavitation occurs on propeller blades, the noise level is increased further. Cavitation contributes to both tonal and broadband noise. The predominant noise levels associated with large vessels are in the frequency range [5–1000] Hz. Noise levels at higher frequency (above some hundreds of Hz) will normally decrease with increasing frequency. Therefore, the predominant noise in the low-frequency band will affect the ambient noise over a large ocean area. Moreover, this low-frequency band happens to overlap with the frequency band in the audible range used by some marine mammals. Concerns about the potential impact of ocean noise on marine fauna prompted the International Maritime Organisation (IMO) to release a non-mandatory guideline for the reduction of underwater radiated noise (URN) from commercial shipping in 2014 (ref. 2). Frequency relationships between marine animal sounds and sounds from shipping. Figure courtesy of B. Southall, NMFS/NOAA. While understanding various noise generation mechanisms is still an on-going area of research, development of different methods to predict shipgenerated noise during the design process becomes more important and imminent. The selection of a method depends on factors such as the objective of the investigation, which stage of the design phase, the anticipated accuracy, and eventual time constraint on delivery etc. S-E and Potential flow methods are fast tools that give a first estimate. 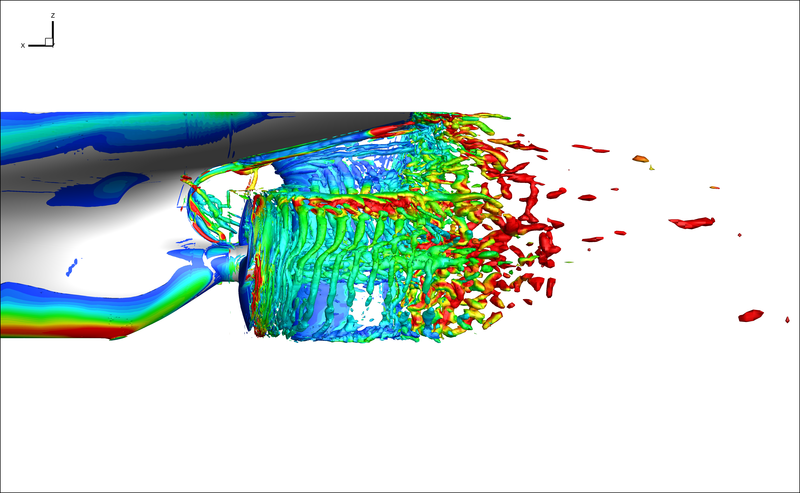 The hybrid CFD method is the most advanced computational tool that is able to give more insight into the flow physics, but the time taken to acquire statistical data from computations is significantly longer. The time required for model testing lies in between the two methods, yet it needs some additional time for model manufacturing and test set-up. Full-scale measurement is always a challenge due to the adverse and changeable underwater environment, the difficulty of obtaining measurement slots with merchant vessels, and the required synchronisation of measurement data from sensors with different modalities in different locations. In the recently ended EU project AQUO, SSPA studied the noise spectra of a coastal tanker fitted with a controllable pitch propeller (CPP) using methods (c), (d) and (e). The three methods yielded fairly good agreement in the URN data. The cross comparison of noise spectra revealed an acceptable level of accuracy of these methods. Example of source identification of the measured full scale noise spectra. As for naval vessels, the noise aspect now also needs to be considered at the initial design stage of commercial ships. A well-designed hull form will require less power and provide more uniform inflow to propellers, thus increasing the propulsive efficiency and reducing the underwater radiated noise caused by the uneven wake flow. The propeller design point should be carefully selected to match the optimal efficiency with the most frequently operated speed/draft condition(s). For commercial ships it is hard to avoid cavitation for efficiency reasons, but cavitation can be controlled and kept to moderate levels. Moreover, propeller design needs the wake field of the ship. It is very important to supply propeller designer with a full-scale alike wake. All these imply an increased design effort, but the result is a quieter ship with higher efficiency and lower emissions. Regardless of the technology used for noise reduction, it is essential to assess the effectiveness of the noise reduction using model-scale measurements, CFD analysis or fullscale measurements. Turbulent vortex structures in the wake of the propelled hull (DDES method). Shipping noise in an area of the ocean can be decreased by management of ship traffic. The URN from an individual ship can be reduced by choosing an operational profile that gives the best URN performance. Ships fitted with fixed pitch propellers (FPP) will normally be quieter when propeller shaft speed is reduced. Thus “slow steaming” is also helpful for reducing URN with FPP propellers. The scenario is however quite different for ships fitted with controllable pitch propellers (CPP). When operating at reduced speeds, the normal operation of keeping the propeller at a constant RPM and decreasing the pitch setting could have negative effects with regard to power consumption and noise emissions, because a decreased pitch shifts the propeller away from its optimal efficiency point and results in cavitation on the pressure side. The study of the coastal tanker in the AQUO project confirmed this result. The solution for such ships at low speeds would be to operate with variable RPM according to a combinatory curve optimised for best URN performance. To sum up, SSPA offers predictive tools and noise reduction methods to assist customers who want to achieve greener shipping. For more info, read our prize-winning paper at NuTTS 2015 (ref. 8). 1. Wright, A.J. (Ed.) 2008, “Underwater Radiated Noise of Ocean-Going Merchant Ships”. International Workshop on Shipping Noise and Marine Mammals, Hamburg, Germany, 21st-24th April 2008, held by Okeanos - Foundation for the Sea. 2. IMO Marine Environment Protection Committee, “Guidelines for the reduction of underwater noise from commercial shipping to address adverse impacts on marine life”, MEPC.1/Circ.833, 7 April 2014. 3. Hildebrand, J. A. 2009, “Anthropogenic and natural sources of ambient noise in the ocean”. Marine Ecology Progress Series, Vol. 395: 5–20. 4. Johansson, T., Hallander, J., Karlsson, R. Långström, A. and Turesson, M., 2015, “Full scale measurement of underwater radiated noise from a coastal tanker”, OCEANS’15, Genova, Italy. 5. Hallander, J., Karlsson, R. and Johansson, T., 2015, “Assessment of underwater radiated noise, cavitation and fuel efficiency for a chemical tanker”, OCEANS’15, Genova, Italy. 6. Hallander, J. and Johansson, T., 2015, “Underwater radiated noise measurements on a chemical tanker - comparison of full-scale and model-scale results”, 4th Int’l Conference on Advanced Model Measurement Technology for the Maritime Industry (AMT’15), Istanbul, Turkey. 7. Li, D.Q., Hallander, J., Johansson T. and Karlsson R., 2015, “Cavitation Dynamics and Underwater Radiated Noise Signature of a Ship with a Cavitating Propeller”, VI International Conference on Computational Methods in Marine Engineering, MARINE 2015, Rome, Italy. 8. Li, D.Q., Hallander, J. and Karlsson R., 2015, “Progress in predicting pressure pulses and underwater radiated noise induced by propeller with pressure side cavitation”, NuTTS’15, Cortona, Italy. Propeller underwater radiated noise: A comparison between model scale measurements in two different facilities and full scale measurements. Authors: G. Tani, M. Viviani, J. Hallander, T. Johansson, E. Rizzuto. Applied Ocean Research, Volume 56, March 2016, Pages 48–66. The link is available until 29 March 2016.